On March 31st, I celebrated my 30th birthday by running the IU Mini Marathon for the first time! I'd heard about the notoriously hilly IU Mini course, but this year I finally experienced it for myself. As we were lining up at the start, I mentioned to an acquaintance from Alex's and my running group that it was my first time on the course. She pointedly said, "This is a Ben Bartley course." Ben is the training director for our group, and he's also a member of the IU Mini steering committee; I'm not sure if he was personally responsible for mapping the course or not, but whoever did it seems to share his affinity for hills. It was great! It took me through some parts of town that I hadn't really seen before, as well as parts that I know and am fond of, and I think it did a decent job of showing off Bloomington to out-of-town folks who came in for the race -- like Chris chrisamaphone, who had an excellent race and finished rather faster than I did. Alex oniugnip also had an excellent race, finishing in 1:33:24 (and winning a pair of Vibram FiveFingers for being the first runner to cross the finish line wearing them). Here's a great picture of him airborne somewhere around mile 2. I was hoping to beat my 2:06:31 half marathon PR from a couple years ago, and I thought I might even have a shot at finishing in under 2 hours, but I came in at 2:10:01, which was 34th of 56 runners in my division. Aside from the hilly course, my other (and less defensible) excuse for my slow time is that I honestly didn't know when to start running! Alex and Chris had apparently investigated the timing situation beforehand and known what was up, but I had just assumed that the race would work like every other road race I've been in since 2004, where you get an RFID device to wear and there are mats at the start and finish that record the time when you run over them. Your time for the race is the difference between the two. It's a great system, because it eliminates the need to jostle for a position close to the starting line. Instead, people sort of just mill around in the general vicinity of the starting line until the race begins, and then they start at their leisure. At the Mini, we also had RFID whatsits, so I wasn't expecting anything out of the ordinary. My acquaintance from the running group and I were idly chatting when suddenly a starting gun went off somewhere up ahead of us. "Oh! Uh, is that the start?" "Um, maybe?" We shrugged, then made an awkward, shuffling start, not sure if we were actually supposed to be running yet or not. I couldn't see what was ahead of us on the road, because it was filled with other shuffling would-be runners, but I supposed that somewhere up ahead, there was going to be a mat to run across. But when we'd all been shuffling along for some time and no mat had been in evidence, I figured that, well, the race must be on. As it turned out, everyone's clock had started simultaneously when the gun went off, and instead of a mat at the finish line, they had funky overhead antennas -- you can see what those looked like in the top right corner of this picture of me finishing. So I probably lost thirty seconds or so to that. I'll know better next time. 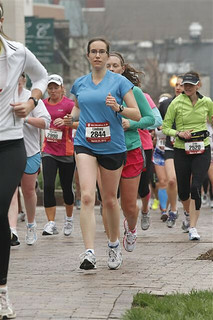 The race was part of my current round of marathon training -- Alex and I are both running the Toronto Marathon on May 6. In fact, the half marathon happened to fall on a weekend when I was supposed to do the first of two 20-mile training runs for the marathon. Obviously, that wasn't going to happen, but since the program I'm using called for a 20, a 12-mile recovery week, and then another 20, I figured I'd just do the two 20-mile runs on back-to-back weekends after the half marathon. That would have sort of been asking for trouble already, but what I actually ended up doing was even worse -- I procrastinated on the first 20, then crammed both of them into last week, only five days apart. It was the first time I've ever done two runs that long that close together, and I can't say I really recommend it. I seem to be fine now, though. Now that the toughest part of training is over with, I'm really looking forward to Toronto. The course actually has a negative drop in elevation, which I think bodes well for a PR. I'll try to go out somewhere between the 4:15 and 4:30 pace groups and see where that gets me. By the way, in case you're wondering what the most 1337 way to run a sub-4:30 marathon is, I'm pretty sure it's 8 5km blocks in 32 minutes each, then the last 2.195km in 13:37. Total time: 4:29:37. Sadly, this is 21 seconds slower than my PR. Otherwise, it would totally be my goal for Toronto. Congrats on another great finish! :) I've only run flat courses so far. Thanks! I hadn't been feeling so great about my time, but considering how hilly it was, a time that's only 3.5 minutes slower than my PR doesn't seem so bad.